How Many Voters Didn’t Flip Over the Ballot? Because there was absolutely no indication on the front of Tuesday’s ballots that there were loads of ballot props listed on the back, as many as 27 percent of voters may have never even turned over the page. According to a preliminary Board of Elections count, 1,026,168 people voted for mayor on Tuesday, but the ballot prop with the most votes — Prop 1, on the limited legalization of casino gambling — only received 756,250 votes. 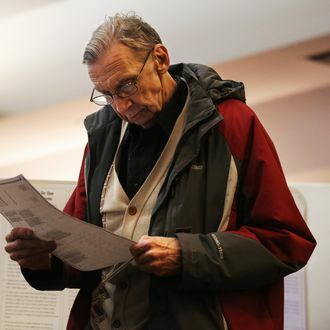 It’s impossible to know, however, how many people were unaware of the other side of the ballot, and how many did turn over the page but, confronted with size-0 font and inscrutable questions about Adirondack land rights, simply lost interest.